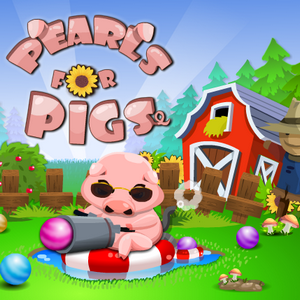 The fun, and addictive free online game “Pearls For Pigs” was added to the Arcade section of our website. Your goal in the game is to prevent the pearls from reaching the wolf by shooting matching pearls into the line of pearls. You must match 3 or more of the same pearls in order to remove them. Use your MOUSE to Aim and Shoot the pearls. Press the SPACEBAR on your KEYBOARD to switch pearls. Be sure to shoot where you see the bonus pearls for extra points, etc!